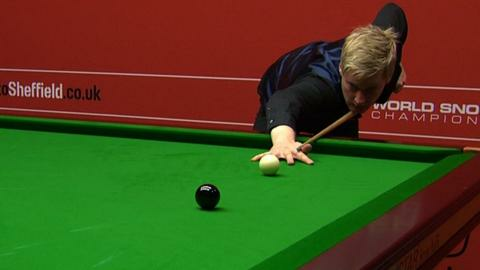 World number one Neil Robertson beat Mark Allen 13-7 to reach the World Championship quarter-finals. The Australian, champion in 2010, had trailed 7-6, but fought back to set up a meeting with England's Judd Trump, who defeated Ryan Day of Wales 13-7. Shaun Murphy, the 2005 winner, will face current holder Ronnie O'Sullivan following a 13-8 win over Marco Fu. Wales' Dominic Dale reached the last eight for the first time since 2000, beating Michael Wasley 13-4. The 42-year-old led 12-4 going into the final session and needed just one frame to book a meeting with Barry Hawkins which will begin on Tuesday. Robertson meanwhile is bidding to win snooker's two biggest ranking events in one season, having already claimed the UK Championship in December. In disposing of Allen, 28, he reeled off seven frames in a row during the last two sessions and made breaks of over 50 in each of the final four frames. The 32-year-old twice came close to recording his 100th century break of the season but missed pots when on 94 and 92 in the last two frames of the match. "Those last two frames I was like a cricketer on 190 or something like that," said Robertson, who has smashed Judd Trump's record of 61 centuries in a campaign. "It was unfortunate. I missed the black with one red left and I thought I hit the black perfectly and I was about to celebrate but it rattled in the jaws. "The snooker gods are going to keep you guys waiting a little bit longer." Murphy, 31, will meet O'Sullivan for the first time since a 13-10 defeat at the Crucible in 2011 after he disposed of Fu to reach the last eight. "Ronnie's a massive favourite to win the tournament," said Murphy, who will be in action on Tuesday. "I've only beaten him once in all the times we've played - even though there haven't been that many. "He's a genius and he's the man everyone comes to see. The match is in his hands as I see it, if we both play our best then I think he wins."